Let me be honest. When I first moved to Vietnam’s bustling capital Hanoi I knew nothing – NOTHING – about Vietnamese food. I’d only eaten pho once before and I had embarrassingly pronounced it ‘po’. But oh did I learn quickly. 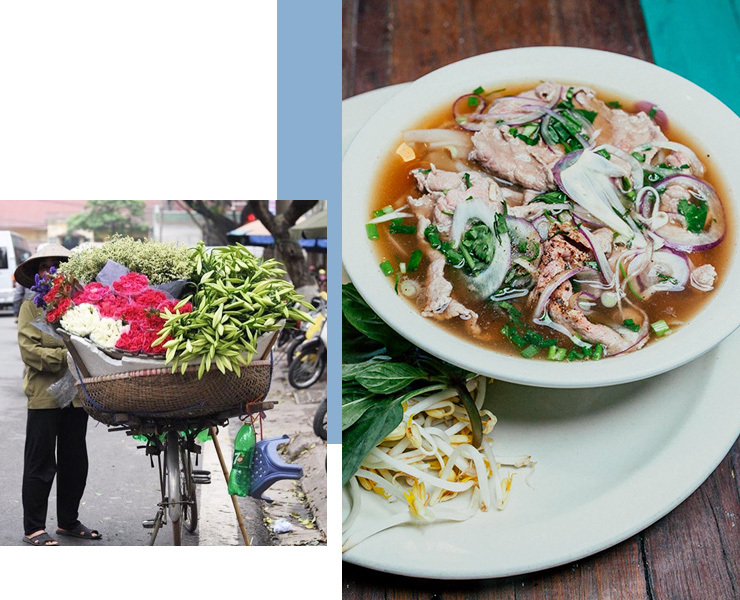 Hanoi is an eating paradise where the range of delicious options is overshadowed only by their absolute affordability. 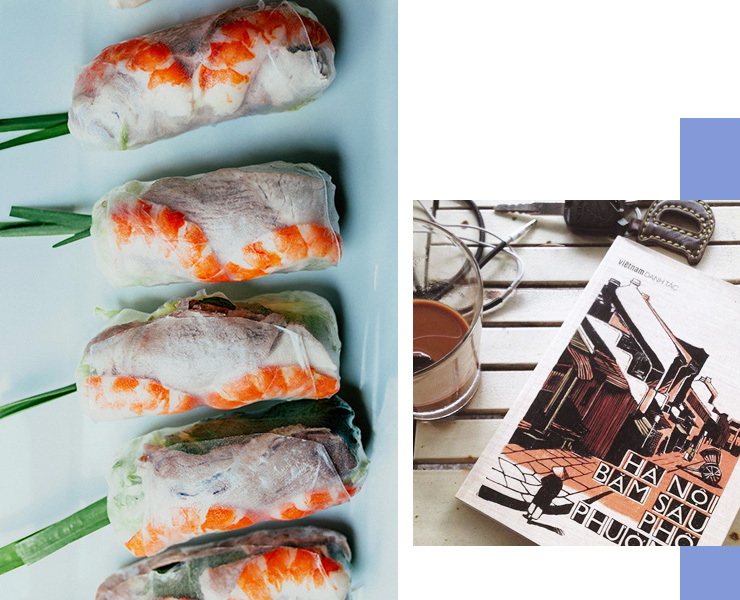 On any given day, you could buy crispy, just-fried spring rolls stuffed with pork and prawn, follow it with Hanoi’s famous grilled fish in the bustling Old Quarter, finish with a potent Vietnamese coffee and still have change left over from $10. Whether you have 24 hours in the Communist capital and birthplace of pho – or a much longer holiday – here is our guide to Hanoi’s must-visit gems; from the secret street food stalls to decadent cocktails, make time to fit them all in! Pulling up a teeny-tiny chair and sitting kerbside at some of Hanoi’s hidden street food stops is obviously non-negotiable. Here are our tips for the best street food to be found in Hanoi. This banh mi-with-a-twist stall is run from a middle-aged lady's front room at Hang Giay Street in Hanoi's Old Quarter. She whips up deliciously fresh omelettes with fresh herbs on crusty French baguettes for a grand sum of 50 cents. Perfect for breakfast. Bun Cha is often overlooked in favour of pho as the supreme Vietnamese street food, but I think the smoky pork belly and vermicelli noodles in a sweet broth, topped with Vietnamese mint and fresh herbs is Vietnam's best ever dish. It's almost impossible to find outside of Hanoi too, so it's a must get while in town. Head straight to Phung Hung street at the top of the Old Quarter for Bun Cha options aplenty. I didn’t know how good spring rolls could really taste until I had the real thing made right in front of my eyes outside the Hanoi Cathedral on Ly Quoc Su Street. Dipped in to-die-for sauce that’s a combo of fish sauce, sugar, vinegar and chilli = heaven. Lau is a Vietnamese dinner tradition that’s based on ‘making your own’. Your group sits down on small chairs around a hotpot and is given a plate of raw vegetables and meats of your choice. You sizzle and grill the items into the hot pot and share away! Head to the corner of Phan Dinh Phung and Ly Nam De streets in Hanoi to give it a crack. Hanoi’s best restaurants marry excellent Vietnamese food with a refined atmosphere for when you need a moment away from beeping motorcycles and balmy weather. There’s one dish on the menu at the Cha Ca Va La Long restaurant, and it has been perfected over centuries. That one dish is Cha Ca: delicious fried fish topped with a special white sauce, vermicelli noodles and herbs. Funnily enought the Cha Ca dish can be found at 14 Cha Ca Street! KOTO is a not-for-profit restaurant providing career training to disadvantaged teens and overlooks the majestic Temple Of Literature (considered to be the world’s first university). The food is a delicious mix of modern Vietnamese and the good food, good service and good cause make for a great experience. If you ever wished someone would bring together almost every type of street food in one place, here it is at Quan An Ngon. There's Banh Xeo (crispy prawn pancakes), every type of pho soup and nem (spring rolls) you could want. All of the different types of foods are cooked in stalls along the perimeter of the restaurant, while you sit in the middle of the stalls with a bird's eye view of all the variety. This is one for the vegetarians. Com Chay is a small, elegant vegetarian restaurant down a quiet alleyway off Tran Hung Dao Street that offers a range of set vegetarian menus. The food is next level good and a rare treat in in a city where it can be pretty hard to find meat-free options. Talk about options, there’s a drink for every moment in Hanoi: kickstart the day with a jolt of energy in the form of super-strong Vietnamese coffee or relax with poolside cocktails at one of the grand old hotels of Asia. For all the beer and all the action, head to the junction of 20 Ta Hien Street in the Old Quarter kown as 'Bia Hoi Corner'. Sip on freshly made beers and watch the motorbikes/locals/tourists go past. The swanky, old world resort of Asia, the Sofitel Metropole, is the place for glamorous old school cocktails. Sit out by the pool in the balmy surrounds wearing white linen, and be ready to spend up big. When I worked in Hanoi, my amazing colleagues opened an organic coffee shop that not only gives back to the farmers who work in the coffee fields, but also makes an exceptional espresso. If you have a daily cappuccino habit, you can hit up Oriberry in the West Lake area, knowing it is Vietnamese to the core. If you’re worried about how you’ll cope without all the good food when your holiday is over, there’s an obvious solution: book into one of Hanoi’s best cooking classes and learn for yourself. Hidden Hanoi is my pick for an authentic Vietnamese cooking class. Each class starts with a romp through the markets bargaining and trying all the random produce (100 year old egg anyone?) Then bring back your bounty to the elegant, and importantly, air conditioned house turned cooking school.